The month of June has drawn to a close and what a great fishing month it was. The walleye bite was probably the most consistent day-in-and-day-out I’ve seen in some time. Granted, they might not be biting everywhere all the time, but they were biting somewhere most of the time. It was pretty hard NOT to catch fish on any given day. And if current weather patterns continue, July should be every bit as good as June if not better. Saturday’s bite (6/30/’12) was one of the best big fish (21-inches or better) bites of the summer. We had several fish in the 3-4 lb. class and very few under 18- inches. I saw the catches of several other anglers at the fish cleaning station that had done every bit as good. One had a couple of fish over 5-lbs. Those are nice fish any day! A local walleye tournament produced five-fish limits (no more than five walleye per boat could be entered) that averaged 20-lbs. or better. Again, the fishing seems darned consistent all around the bay from Au Gres to Caseville. While the deep water fishery (35-40 feet) seems to have slowed a bit (it’s still the place to take an occasional 5-6 lb. walleye), near shore depths of 8-10 feet (anglers must continually check for weeds and smaller fish), 15-21 feet, and 24-26 feet were really productive yesterday. It wasn’t uncommon for anglers to have two and sometimes three fish on at a time. When getting into a pocket of good fish, try and establish a line on the GPS (Global Positioning System) where you first encountered consistent fishing and where you ran out of the fish, and then work this line until it’s no longer productive. We had a three-quarter mile stretch like that yesterday that never quit producing fish. 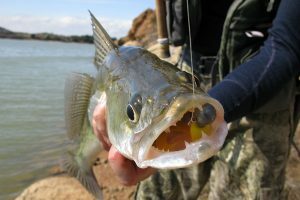 Anglers need to continually check their lines for smaller fish and missed bites resulting in lost nightcrawlers. A lot of perch and small white bass showed up in the fishery where we were yesterday, and if a given rod suddenly quit producing walleye, it was a safe bet there was either a small fish on the line or the bait had been swiped from the crawler harness. When the bite is good, everyone wants a piece of the action, but don’t expect an angler to tell you exactly where he is. If he did, every boat in the area not catching fish would soon be there. 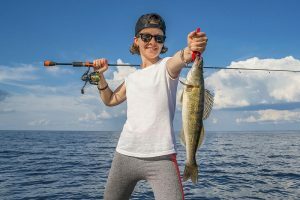 All the noise from propellers and boat engines will soon shut those fish down, ending an otherwise excellent bite. However, if we are struggling, I like to know what depth of water the angler is fishing because I’ve found that is normally the key to getting back in the action. Leave the unproductive water and try the depths where other anglers are continually catching fish. 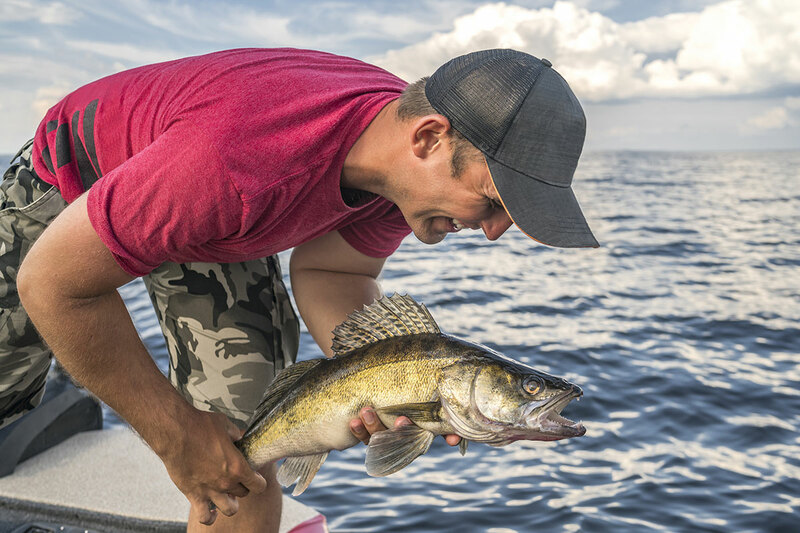 Don’t assume the ONLY place to catch walleye is right where one particular angler is catching fish. Trust me–it isn’t. With over 240,000 acres of water in inner Saginaw Bay there are far more places than just one producing good fishing. Another important factor is matching trolling speed with the in-line weight used ahead of the crawlerharness. 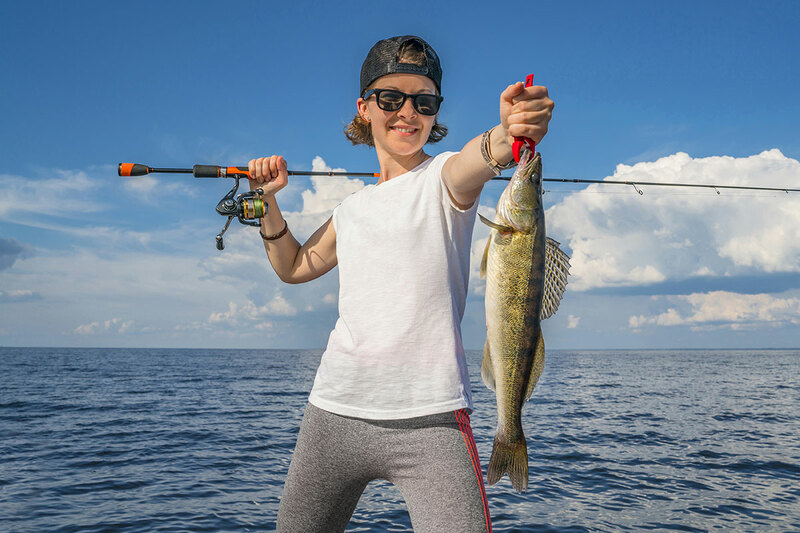 If an angler catching fish tells you he is using two-ounce in-line sinkers 25-35-feet back, you automatically know he has to be in water over 15 feet because he would be dragging bottom otherwise at normal walleye trolling speeds of 1.4-1.7 mph. As a rule of thumb, use 1/2-oz. in-line weights 15-18 ft. back behind the trolling boards when fishing waters 10-ft. or less, 1-oz. weights 20-40 ft. back in water 12- 15 ft. in depth, and 2-ounce weights 25 feet or more in water over 17 ft. Trolling speed will always influence the amount of weight and distance lures are run behind the boards in a given depth of water. Today’s tip: We use a small cooler filled with ice water to wash our nightcrawlers in once we are ready to start fishing, keeping the the majority of crawlers in a bag of bedding in a larger cooler. Crawlers kept in the ice water will stay lively until used and there will be less mess on the boat to clean up later.